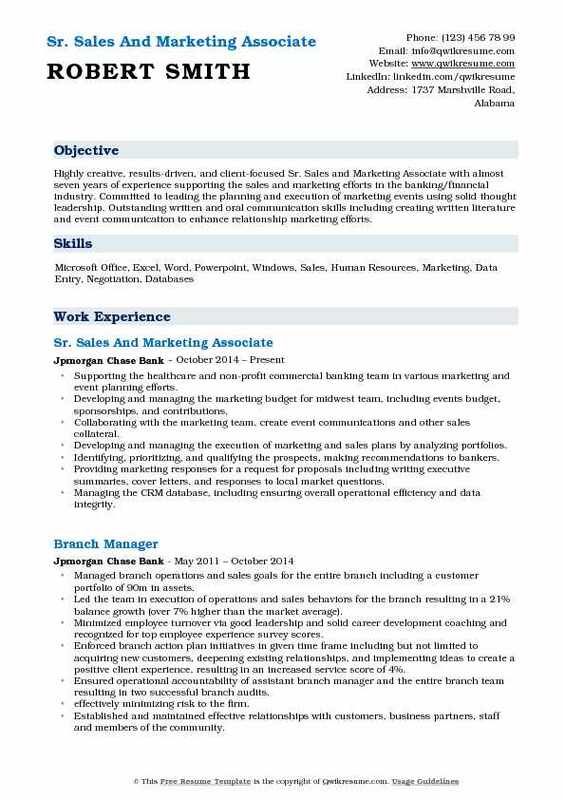 The Sales and Marketing Associate is hired for assisting in various facets of sales and marketing including developing marketing programs, proposal preparations, supporting sales goals and so on. 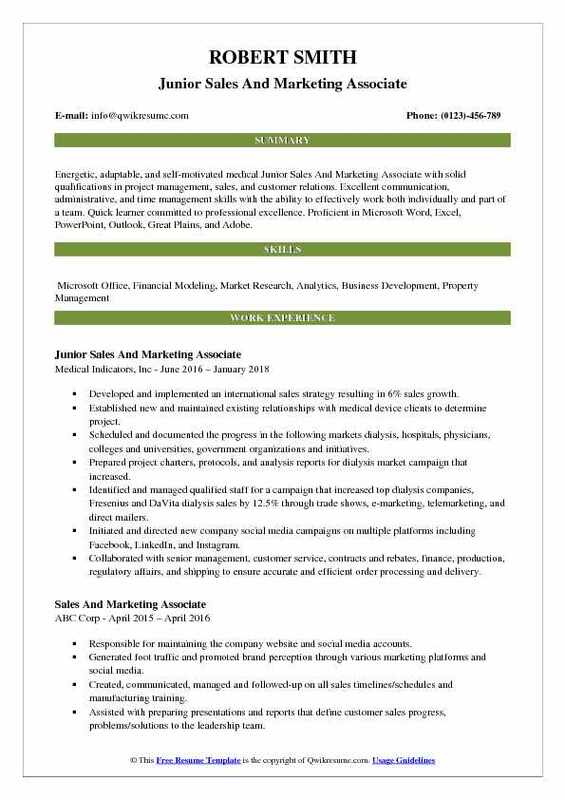 The other core duties included in a professional Sales and Marketing Associate resume are – developing new business opportunities, developing and implementing sales strategies, facilitating client meetings, reporting on forecasts, developing market analysis, delivering sales presentations, evaluating accounts, assisting in sales and marketing campaigns, and participating actively in all seminars and workshop. 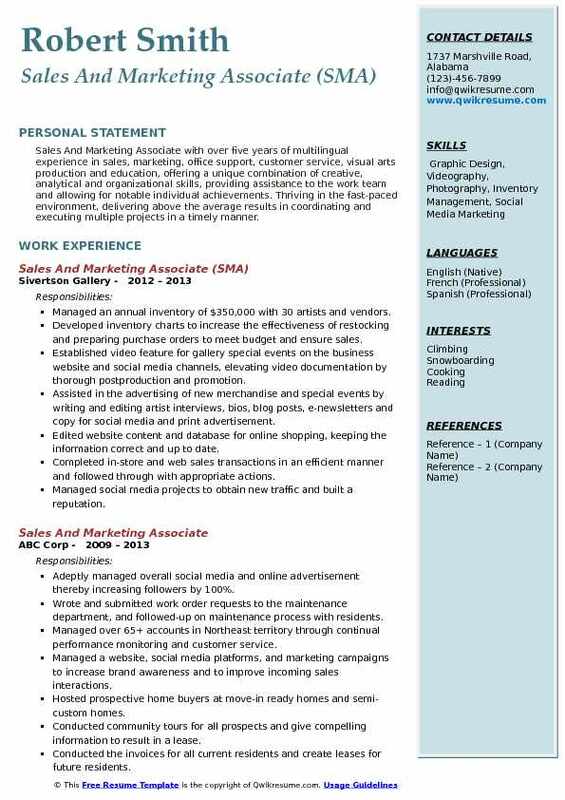 The required qualifications for this post include – excellent verbal and written communication skills, strong organizational and following-up skills, demonstrable experience in sales/marketing platform, above average working knowledge and experience in keynotes, MS Excel, PowerPoint, outlook, pages, internet and online marketing. To take this challenging job, candidates need to depict in the resume a degree, preferably a technical one. 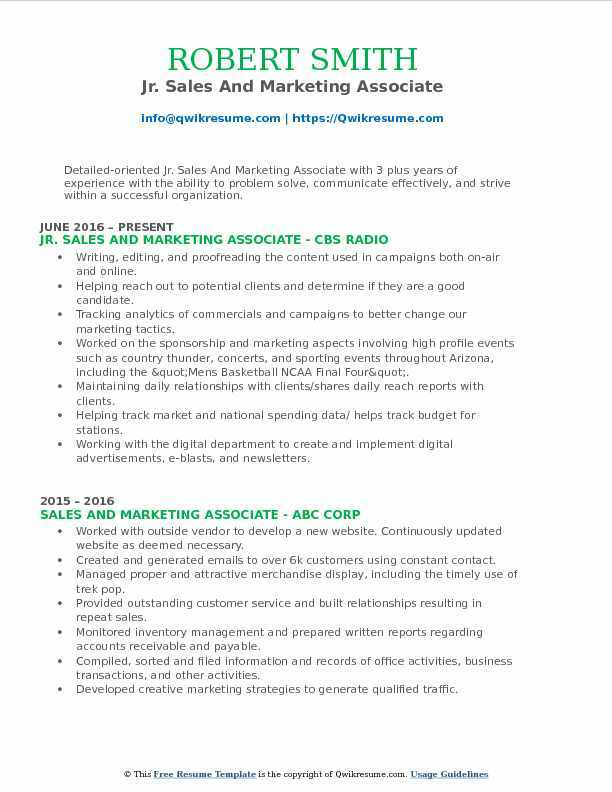 Summary : Senior Sales And Marketing Associate with 7 years of experience want to become part of an innovative growing company, offering both creative and analytical opportunities that highlight my skills acquired through university schooling and relative experiences. Skills : Results Driven, Collaborative, Detail Oriented, Strategic Planning & Analysis, Data Quality, Reporting, Event Management, Campaign Development, Human Resources. Strategically overseeing a diverse range of responsibilities by being an integrated partner supporting national and local sales/marketing goals to enhance revenue generation and market share. Preparing pitch books, product, and marketing material for clients that span across various industries. Providing relevant industry intelligence and market trends to identify sales opportunities. Ongoing analysis of performance metrics to develop and advance future marketing strategies to meet goals and enhance client relationships. Managing and coordinating the events and campaigns from origination to execution based on client population and business objectives, innovation roundtables, networking events, cocktail receptions, and panel discussions. Leadership in managing the delivery of national marketing initiatives and special projects driven by market needs. Overseeing the timelines and taking ownership of deliverables through each stage of the project lifecycle. Providing analytical support and monitor data quality, ability to interpret and summarize data and trends. Summary : Seasoned Sales And Marketing Associate is seeking a rewarding new position that requires advanced sales experience, the ability to handle challenging projects and the opportunity to improve the bottom line. Leading the execution of the budget by effectively partnering with outside vendors for catering, audiovisual and technical support without exceeding expenses on corporate events. Developed and created the budget for catering and audiovisuals. Consistently developing new catering options to broadened the hotel's culinary selections. Fully managing sales staff on a day to day sales operations. Managing the maintenance staff with set-up and breakdown on all meeting room events. Ensuring all food and beverages inventory is fully stocked for future and current catering events. Select and price high-quality sandwiches, salads, and breakfast goods for various catering needs. Directed catering staff in set-ups and breakdowns on all meetings. Organizing and reconstructing a successful catering menu to follow specific dietary and nutritional standards to produce a successful surplus for meeting department. Developed strong administrative skills through data entry, answering telephone calls, providing high-quality customer service, filing client records, and calendar management. Objective : Energetic, adaptable, and self-motivated medical Junior Sales And Marketing Associate with solid qualifications in project management, sales, and customer relations. Excellent communication, administrative, and time management skills with the ability to effectively work both individually and part of a team. Quick learner committed to professional excellence. Proficient in Microsoft Word, Excel, PowerPoint, Outlook, Great Plains, and Adobe. Developed and implemented an international sales strategy resulting in 6% sales growth. Established new and maintained existing relationships with medical device clients to determine project. Scheduled and documented the progress in the following markets: dialysis, hospitals, physicians, colleges and universities, government organizations and initiatives. Prepared project charters, protocols, and analysis reports for dialysis market campaign that increased. Identified and managed qualified staff for a campaign that increased top dialysis companies, Fresenius and DaVita dialysis sales by 12.5% through trade shows, e-marketing, telemarketing, and direct mailers. Initiated and directed new company social media campaigns on multiple platforms including Facebook, LinkedIn, and Instagram. Collaborated with senior management, customer service, contracts and rebates, finance, production, regulatory affairs, and shipping to ensure accurate and efficient order processing and delivery. 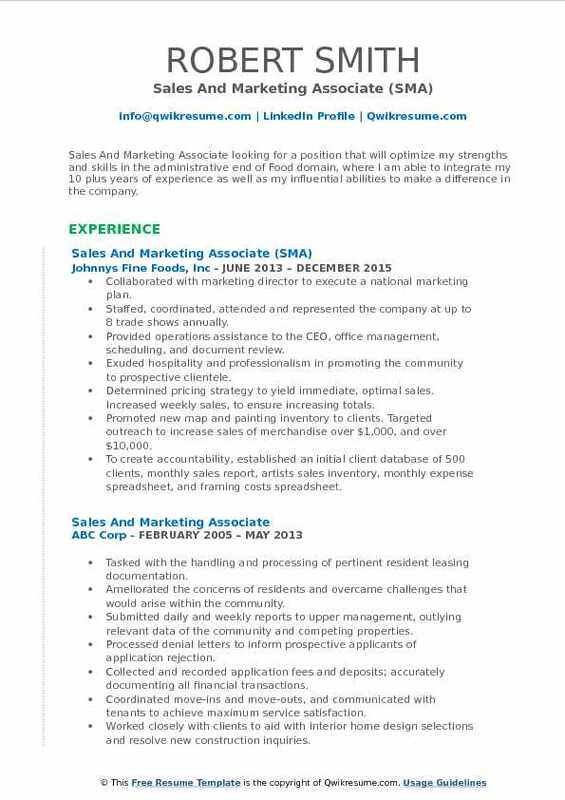 Summary : Sales And Marketing Associate looking for a position that will optimize my strengths and skills in the administrative end of Food domain, where I am able to integrate my 10 plus years of experience as well as my influential abilities to make a difference in the company. Collaborated with marketing director to execute a national marketing plan. Staffed, coordinated, attended and represented the company at up to 8 trade shows annually. Provided operations assistance to the CEO, office management, scheduling, and document review. Exuded hospitality and professionalism in promoting the community to prospective clientele. Determined pricing strategy to yield immediate, optimal sales. Increased weekly sales, to ensure increasing totals. Promoted new map and painting inventory to clients. Targeted outreach to increase sales of merchandise over $1,000, and over $10,000. To create accountability, established an initial client database of 500 clients, monthly sales report, artists sales inventory, monthly expense spreadsheet, and framing costs spreadsheet. 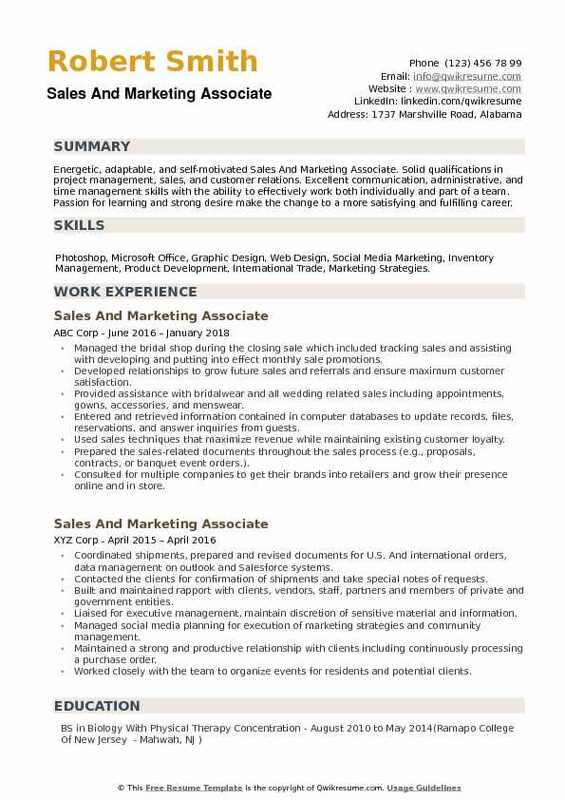 Headline : Sales And Marketing Associate with over five years of multilingual experience in sales, marketing, office support, customer service, visual arts production and education, offering a unique combination of creative, analytical and organizational skills, providing assistance to the work team and allowing for notable individual achievements. Thriving in the fast-paced environment, delivering above the average results in coordinating and executing multiple projects in a timely manner. Managed an annual inventory of $350,000 with 30 artists and vendors. Developed inventory charts to increase the effectiveness of restocking and preparing purchase orders to meet budget and ensure sales. Established video feature for gallery special events on the business website and social media channels, elevating video documentation by thorough postproduction and promotion. Assisted in the advertising of new merchandise and special events by writing and editing artist interviews, bios, blog posts, e-newsletters and copy for social media and print advertisement. Edited website content and database for online shopping, keeping the information correct and up to date. Completed in-store and web sales transactions in an efficient manner and followed through with appropriate actions. Managed social media projects to obtain new traffic and built a reputation. Assisted CEO for all client and sales meetings, presentations, events, email correspondence, research and report analysis. Summary : Highly creative, results-driven, and client-focused Sr. 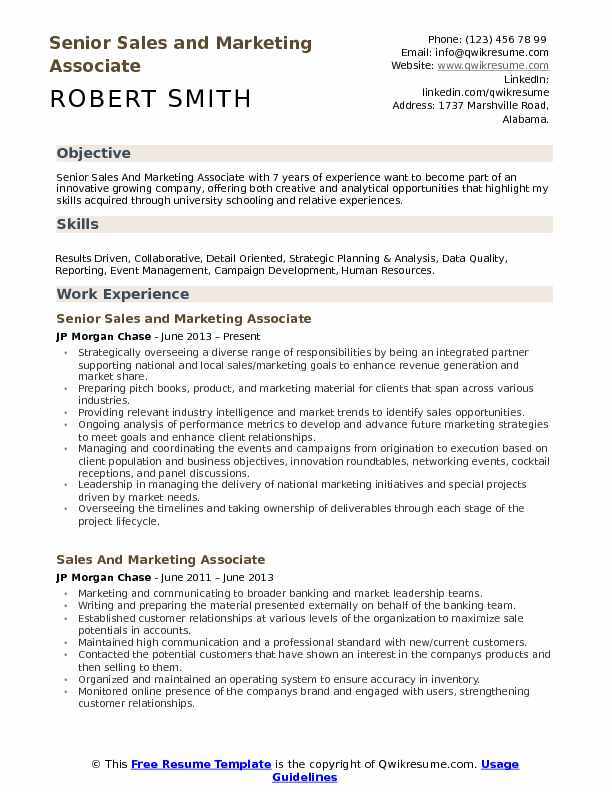 Sales and Marketing Associate with almost seven years of experience supporting the sales and marketing efforts in the banking/financial industry. Committed to leading the planning and execution of marketing events using solid thought leadership. Outstanding written and oral communication skills including creating written literature and event communication to enhance relationship marketing efforts. Supporting the healthcare and non-profit commercial banking team in various marketing and event planning efforts. Developing and managing the marketing budget for midwest team, including events budget, sponsorships, and contributions. Collaborating with the marketing team, create event communications and other sales collateral. Developing and managing the execution of marketing and sales plans by analyzing portfolios. Identifying, prioritizing, and qualifying the prospects, making recommendations to bankers. 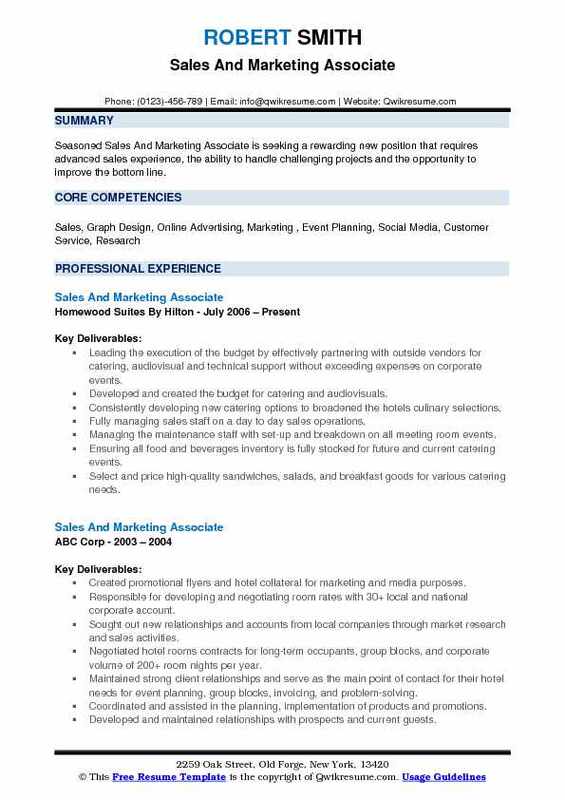 Providing marketing responses for a request for proposals including writing executive summaries, cover letters, and responses to local market questions. Managing the CRM database, including ensuring overall operational efficiency and data integrity. Partnering with bankers to develop and analyze the success of top-tier clients and prospects to enhance relationships and determine where additional business can be obtained. Managing the industry-specific marketing campaigns and programs, including identifying a need based on the analysis of a market's top tier portfolios, creating a marketing campaign or sales initiative, communicating to market, and measuring success. Objective : Detailed-oriented Jr. Sales And Marketing Associate with 3 plus years of experience with the ability to problem solve, communicate effectively, and strive within a successful organization. Writing, editing, and proofreading the content used in campaigns both on-air and online. Helping reach out to potential clients and determine if they are a good candidate. Tracking analytics of commercials and campaigns to better change our marketing tactics. Worked on the sponsorship and marketing aspects involving high profile events such as country thunder, concerts, and sporting events throughout Arizona, including the "Men's Basketball NCAA Final Four". Maintaining daily relationships with clients/shares daily reach reports with clients. Helping track market and national spending data/ helps track budget for stations. Working with the digital department to create and implement digital advertisements, e-blasts, and newsletters. Working with our "live events and entertainment" department to help coordinate events, and make sure sponsorships are running as smoothly as possible. Working with creative and advertising agencies to create successful marketing campaigns. 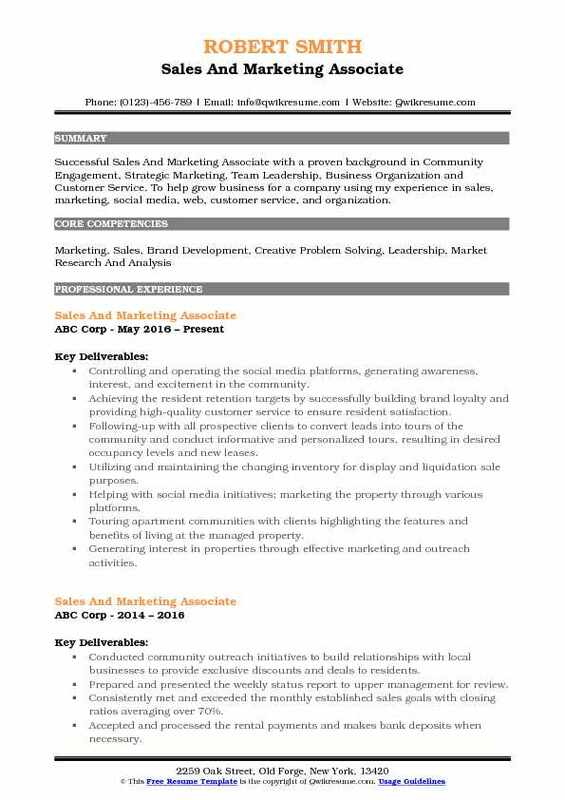 Objective : Successful Sales And Marketing Associate with a proven background in Community Engagement, Strategic Marketing, Team Leadership, Business Organization and Customer Service. 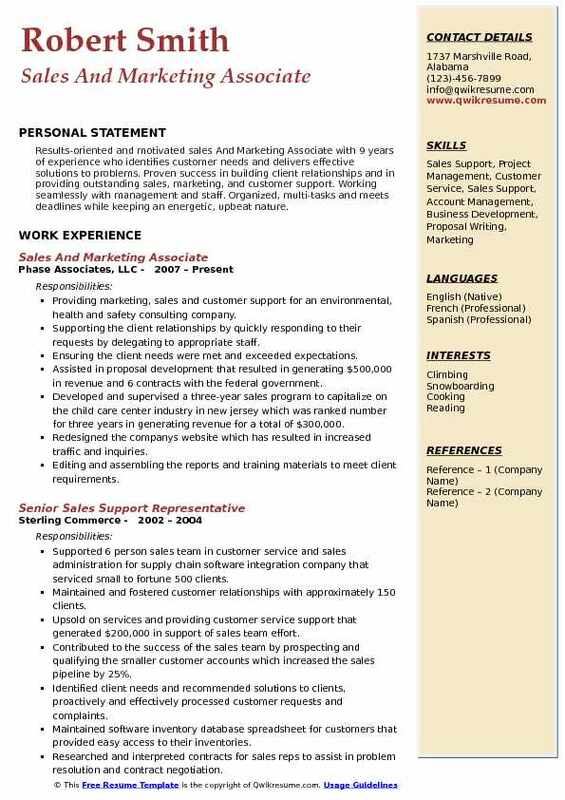 To help grow business for a company using my experience in sales, marketing, social media, web, customer service, and organization. Controlling and operating the social media platforms, generating awareness, interest, and excitement in the community. Achieving the resident retention targets by successfully building brand loyalty and providing high-quality customer service to ensure resident satisfaction. Following-up with all prospective clients to convert leads into tours of the community and conduct informative and personalized tours, resulting in desired occupancy levels and new leases. Utilizing and maintaining the changing inventory for display and liquidation sale purposes. Helping with social media initiatives; marketing the property through various platforms. Touring apartment communities with clients highlighting the features and benefits of living at the managed property. Generating interest in properties through effective marketing and outreach activities. Preparing letters, memos, and other documents using word processing, spreadsheet, database, or presentation software. Summary : Results-oriented and motivated sales And Marketing Associate with 9 years of experience who identifies customer needs and delivers effective solutions to problems. Proven success in building client relationships and in providing outstanding sales, marketing, and customer support. Working seamlessly with management and staff. Organized, multi-tasks and meets deadlines while keeping an energetic, upbeat nature. Providing marketing, sales and customer support for an environmental, health and safety consulting company. Supporting the client relationships by quickly responding to their requests by delegating to appropriate staff. Ensuring the client needs were met and exceeded expectations. Assisted in proposal development that resulted in generating $500,000 in revenue and 6 contracts with the federal government. Developed and supervised a three-year sales program to capitalize on the child care center industry in new jersey which was ranked number for three years in generating revenue for a total of $300,000. Redesigned the company's website which has resulted in increased traffic and inquiries. Editing and assembling the reports and training materials to meet client requirements. Provided OSHA compliance project management for 2 clients, interpreted the legislation, fulfilled the requirements and met government deadline. Objective : Energetic, adaptable, and self-motivated Sales And Marketing Associate. Solid qualifications in project management, sales, and customer relations. Excellent communication, administrative, and time management skills with the ability to effectively work both individually and part of a team. Passion for learning and strong desire make the change to a more satisfying and fulfilling career. Skills : Photoshop, Microsoft Office, Graphic Design, Web Design, Social Media Marketing, Inventory Management, Product Development, International Trade, Marketing Strategies. Managed the bridal shop during the closing sale which included tracking sales and assisting with developing and putting into effect monthly sale promotions. Developed relationships to grow future sales and referrals and ensure maximum customer satisfaction. Provided assistance with bridalwear and all wedding related sales including appointments, gowns, accessories, and menswear. Entered and retrieved information contained in computer databases to update records, files, reservations, and answer inquiries from guests. Used sales techniques that maximize revenue while maintaining existing customer loyalty. Prepared the sales-related documents throughout the sales process (e.g., proposals, contracts, or banquet event orders.). Consulted for multiple companies to get their brands into retailers and grow their presence online and in store. Managed various marketing campaigns, including promotional materials, advertisements, and online reviews which have led to increased store activity and revenue.